One of my favourite pieces of MoP information is the potential blacklisting of up to two different battleground maps. I hate the “randomness” of random Battlegrounds. Now I fell down the stairs last night and sprained my ankle so I’m not in the best of tempers but I defy anyone to like a system which thinks five Strand of the Ancients in a row can possibly be ok. My foot is slowly turning that lovely shade of deep purple which looks gorgeous on plants (thinking violets and pansies here) but not so hot on feet. The random Battleground finder is turning my mood the same colour considerably faster. Because there is no choice at all. It’s either use the random queue or don’t PvP. The queue times are considerably longer when you queue to a specific battleground and unreliable too, you may get one in a few minutes and then have to wait hours for the next one or you might just have to wait hours. Compare that to getting a random battleground within 2 minutes of queuing up even at weird times in the middle of the night. Then there is the honour or rather lack of it. For winning a random we get an extra 270 per game winning game, not to mention the conquest points but when you queue for a specific battleground, guess what… no bonus. Now since the honour is an incentive to queue up for randoms, that might seem fair enough until you consider the fact that the bonus honour was implemented to replace the tokens that we used to get. Now I might be a special little snowflake but there are times when I want to chill out in 40 mans, bullying Horde in Stonehearth bunker or seeing just how many people I can kill whilst they are attacking Balinda. At those times, the random Battleground finder throws me into WSG or Strand of the Ancients. Then there are times when I just want to work on my Arathi Basin rep, of course then I get everything and anything but Arathi Basin. Sometimes, sure I really don’t mind which battleground I end up in, I just want to kill people. Then of course I wind up in the Isle of Conquest, the blink and you’ll miss it game where tracking down the enemy faction is akin to finding the fox cub mini-pet, i.e. the odds are not in your favour. Why can’t winning a battleground reward the same honour regardless of how you got there? That way I wouldn’t keep ending up in Strand of the Ancients with a bunch of people who don’t know what they are doing. Blacklisting isn’t necessarily the fix I would have gone for (a system a bit like my old cd player in which it never plays the same song twice in a row would have been my first choice I think) but I have to admit I intend welcoming it with open arms. The only bit I find a bit odd is the caveat about the battleground weekends. So If I exclude the Strand of the Ancients when SotA weekend rolls around, it will unblacklist itself and when I queue to random, there is a chance I’ll still wind up on the beach. On their respective weekends, the smaller maps are often crawling with premades so the sensible solo player wants to avoid them more than ever but as things stand when you queue to random at those times, you still find yourself thrown into the weekend battleground. I was hoping that this change would go a long way towards fixing that issue but it seems not. I understand that Blizzard want their Battleground weekends to be a success even when it’s SotA but I do think this devalues the whole point of the blacklisting to a degree. Yes, we’re getting more new maps so the gap between SotA weekends will be increasing but I’d still like to never ever go there again. So which maps will I be avoiding? Whilst I think it will vary on a character by character basis, SotA is definitely on the list (no surprise there!). Games of two halves don’t work under Blizzard’s model of Player versus Player. If the team who attacks first doesn’t break through the final wall, more often than not they don’t fight in the second half. They want to obtain their losing honor quickly, after all the best possible outcome at that point is to lose fast. Even if you hold the game to a draw, it’s counted as a loss in your statistics because the armoury doesn’t recognise draws (another reason why I dislike the armoury), so you might as well lose fast and hope you get better luck next time around. My Druid and my Shaman like it a lot more than my Priest as both have ways of slowing vehicles down or bringing them to halt outside tailoring nets but despite my good win rate in there, I’d be happy never to have to get sand in my shoes ever again. As for my second choice, I think I’ll wait until I’ve fully tested out all the new maps before committing but Isle of Conquest is a contender. The map is too big for the number of players on it. You can easily go all game without seeing any red name plates and if you do decide to defend in order to get some actual PvP, more often than not it’s you versus 40. On the plus side though, outside of the SotA weekends, everyone who ends up there should be there because they want to be. AV will be full of people who want a proper AV game not a quick rush with zero pvp. Hopefully this change will improve the quality of pvp for all of us because each game is full of players who want to be in that map, who aren’t shuddering behind their screen, who aren’t planning on afking half way through but who are actually there to play and to win. I am curious to see what everyone else goes for avoiding. I know quite a few Horde players who don’t intend ever doing AV or Isle of Conquest again, as well as a few people who hate the two flag carrying 10 mans. Mushan posted about his choices here as well. I think given the size of the pool, this shouldn’t effect queue time apart from perhaps the 40 mans late at night but it will be interesting to see how it all balances out. The latest crop of healing Priest glyphs have finally made it onto the beta and can be purchased from everyone’s favourite oversized Tauren in the Temple of the Jade Serpent. I have to say I’m not impressed. I wish I was, I really do but they’re either massively situational (i.e. require you to be dead! ), have huge cooldowns (confessions) or take away what little control we already have over a spell (Lightspring). The added icing on the cake was tonight my Lightwell provided over 2 million healing. Now that’s something I never expected to see. In my experience, proper raiders will click on it to stay alive because they’ve already figured out that dead, they can’t top the damage meter. If I’m playing with afkers, muppets and the sort of people who show up to lev 70 battlegrounds wearing the gear they got at lev 1, well then at least I can use it. So where does the glyph fit in? 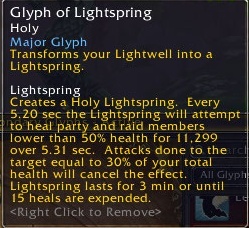 Well right now and much to my surprise I might add, Lightspring is providing exactly the same amount of healing as Lightwell (albeit when you’re below 50 percent health and only every 5 seconds). Lightspring also isn’t clickable at all so in certain environments like LFR where other healers attempt to use all your charges when out of combat to boost their own healing on the meter and the dps are mostly concentrating on standing in bad stuff it might have a place. Everywhere else, I’m erring towards no. In 5 mans, I know at least one fifth of the group (me) will use the unglyphed version which is good enough for me. In PvP (talking battlegrounds), I’d hate the idea of the undergeared squishy waste of space player on 10 percent health who has contributed virtually nothing “stealing” the charge I was rather hoping for when I’m being beaten up. When I consider the fights where historically I’ve got the most out of Lightwell, it’s been ones where multiple people get hit at once and can all click for healing there and then. The fact that you can click the Lightwell whilst stunned or otherwise cc’d also adds to it’s unglyphed appeal. Lightspring is specifically designed to work against that with it’s lack of interaction, 5 second cooldown and 50 percent health minimum. Obviously we don’t know enough about encounter design yet but I really don’t see me using this glyph. That said, I’m glad Blizzard have added it. Options are always good and whilst it’s not my particular cup of tea, I’m sure there will be some Priests who like it or who find a niche for it. On a considerably smaller scale of course and with added sparkles. Now onto the minor glyphs. Despite the fact that you have to do my least favourite thing in the entire game to get any use of out of this particular glyph, I am tempted. 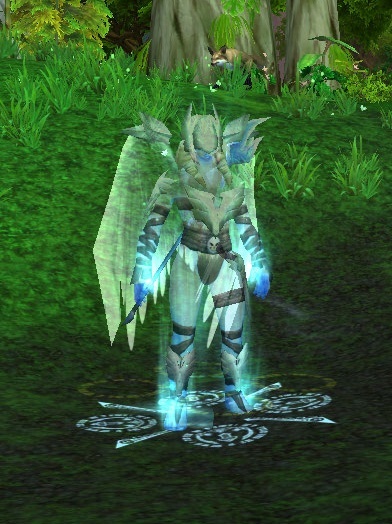 I just wish there was an added side effect like perhaps when an enemy dies near you whilst you have this glyph equipped a tiny shadow of a val’kyr flies away from the corpse. Just something to make it fun and usable in situations where you rarely if ever die. I have to admit I had high hopes for this, with a 30 minute cooldown surely it would force embarrassing secrets from the lips of our guildmates and friends. I imagined myself as a smaller cuter Gnome version of Interrogator Vishas bouncing about demanding to know their “naughty secrets”. I suppose it depends what you call embarrassing. Perhaps if I was a Troll this could be perceived as the sort of scandalous secret I want to keep to myself but as a Gnome… it sounds perfectly normal to me. Unfortunately I know exactly what Tauren tastes like because I accidentally took a bite out of one once! As you can see from these screenshots, in this beta build you can force yourself to confess too. The two minors I can see me using but right now, I’m struggling to think of a use for Lightspring. I’ve been a bit preoccupied with real life stuff recently but when I was flicking through my feed reader, I noticed this post from Tome of the Ancient. At the last count, my drafts folder has something like 105 potential posts gathering dust so before Mists dawns, I intend on getting rid of them by taking a leaf of the Duke of Wellington’s book and yelling “Publish and be damned” at the screen whilst hitting the publish button with my eyes shut. It doesn’t matter what level of pvp you are indulging in, there will always be someone on your team wearing the equivalent of a wedding dress and very little else. It might be the fang set (why they couldn’t just transmog it is anyone’s guess), it might be a lovely black dress or it might be 20 levels out of date but they’ll be there, running about in all their glory attempting to carry the flag. I encountered this in an Eye of the Storm. Fair enough we thought, it’s going to get dressed just before the game starts. Nope, it leapt from the starter stone still wearing that lv 1 robe. Maybe it’s a bot, we thought as it rode down to Fel Reaver on an epic mechostrider. Perhaps it’s making a video and will show super awesome skills that don’t require clothes. Nope, it went splat in approximately one second flat. I then spent the rest of game indulging in my own personal game of trying to “keep the mostly naked gnome alive” which went surprisingly well. Although we did win, I never quite got to the bottom of why they were still wearing that dress, I mean it’s not even very pretty. After this, I’m never going to feel guilty about battlegrounding in slightly behind gear ever again. 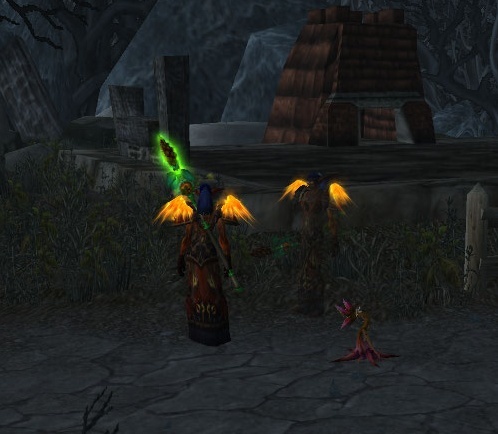 The Blog Azeroth Shared Topic is an interesting one this week. What’s so special about <?> (the item you used in the title)? Do you have an absolute favourite/s that you’ve gathered from the profession? Which ones, if any, are the bane of your existence? Show us pics illustrating those pieces, including an outfit if you use one. Now I fully admit Archaeology is up there with Fishing in terms of professions I dislike but wish I didn’t. That said, I do have a few favourite items. Mirrors and other such reflective surfaces have always fascinated me. The first film I ever watched in a cinema was Disney’s Snow White and despite being terrified of the wicked witch and refusing to eat apples for at least a fortnight in case they were poisoned it was the talking mirror that stuck with me. I remember being really disappointed that the one in my bedroom said nothing, wondering if I was doing it wrong. Before the Great Sundering, the Highborne were known among the night elves for their arrogance, avarice and outlandish clothing. It was said that nothing was so pleasing to the gaze of the Highborne as themselves. These mirrors were created so that elven ladies could see their colorful garments in three full dimensions, yet the reflection often exaggerated the already depraved visage of the viewer. I also love the idea of the mirror acting as a sort of portent of things to come, further twisting the features of the gazer. It’s the Picture of Dorian Gray for the Highborne. For Teasel it serves two purposes, firstly as a reminder of the destruction that arrogance, greed and vanity can bring and secondly as a handy PvP tool. With the aid of this macro it can function a bit like the forthcoming Spectral Guise for Priests, although you need to be both a Druid and a Nightelf. So lets say someone is beating up on you, you cyclone them and use the macro. It puts you into cat form, uses the mirror and then shadowmelds you. From shadowmeld you stealth and wander off, ideally behind a pillar, wall or other handily placed architectural feature. They’re left with a slightly shadowy cat trying to figure out what on earth happened to the Druid they were smacking around. It doesn’t work on everyone, but it works on enough in battlegrounds and world pvp to be worth it. Now there are two reasons why I love this item. First of all, I had a glass menagerie of my own when I was small. My two favourites were a little glass pig and a beautifully delicate swan. My second reason is slightly more WoW related. (I noticed this morning that Navi has a completely different and more accurate take on this little chest so make sure you read hers too). But before Krasus could answer, from the battlefield came a terrible cry. As they all turned toward its source, they witnessed Archimonde with one arm around the giant stag’s head, his other hand twisting his foe’s muzzle to the side. Already the stag’s head turned at an awful angle, hence the cry. It was already too late. The demon, his expression still indifferent, tightened his hold further. A tremendous cracking sound echoed through the region, one that, for just a brief moment, caused all other noises to cease. P637 of Richard A. Knaak’s book “War of the Ancients: The Sundering”. I imagine that as Archimonde twisted Malorne’s neck, the head of that little glass stag cracked and broke even though it was many miles away still safe inside the box. As for who the chest belonged to, well that’s simple. Given that stories link both Elune and Ysera of the Dreaming with Malorne, I like to believe that the “T” stands for Tyrande, High Priestess of the Moon and mother of her people. Now all I have to do is hunt down The Last Relic of Argus and that’s me and Archaeology at peace with each other until MoP is released. When I first read about the forthcoming “Black Market”, my initial gut instinct was “Nooooooo!” but as I thought about it, my opinion shifted. Tier 3 – i.e. the tier set from the original Naxxramas. That would mean for example that Matty could get her Warlock and Priest sets. We can pretty much guarantee the intention to include these as they are in the screenshots. Benediction/Rhok’ledar – like tier 3, these are no longer available in-game and could make a return. Personally I’m of the opinion that you can’t call yourself a Priest without a confetti trailing staff so I really hope these turn up at some point. Crystal Webbed Robe – the same colour/design as the Chan’s Imperial Robes which also seem to have vanished from the game. This might also see a return of the other non set items from the original Naxx which haven’t been reused like the fabulous Plague Bearer. Staff of Rampant Growth and all the other bits and pieces which dropped from the Nature Dragons and weren’t reused when the Dragons were removed from the game. Plans for the Thorium Breastplate, along with any other hard to obtain or removed plans. All the rare mounts and pets, potentially those from the Blizzard store too. I also find myself wondering if removed mounts like the original War bear from Zul’aman and the two from Zul’gurub could make a comeback this way. I have to admit, I’d definitely love to see the ZG ones. I’ve lost count of all the times I ran that instance, being exalted on I think three characters (two of which were exalted by the end of vanilla) and yet I’ve never ever seen either of the mounts drop. The addition of the Paper Flying Machine Kit is also an interesting touch as it’s a TCG item. I wonder if any of the other “junk” items available through the TCG might end up on the Black Market. Just like the real world which it mirrors in so many ways, Azeroth has changed considerably over the last seven years. Plenty of unique and iconic items have bitten the dust along the way and resurrecting those items would add to the game in my opinion. We (who have these items) do not lose anything by others having them too. Our mounts don’t gain a layer of tarnish for each other person on the server who has what we have. Neither does our character shrink and shrivel slightly because we’re no longer unique and special snowflakes. There is no distinction between the person who got their tier 3 at level 60 and those who got towards the end of the Burning Crusade so it’s not as if tier 3 is proof of being an awesome player. Actually given some of the muppets we carried through Naxxramas when it was cutting edge, even if you could prove when someone got it, having it originally isn’t always a sign of stay out of the fire ability either. It’s not even proof of being a part of the tiny percentage of the player base who experienced vanilla Naxx. I got my Benediction in 2005 when Majordomo presented a real challenge to guilds but my staff was in no way diminished by all the Priests who got theirs years later. I’ve seen a lot of people complaining about the Ashes of A’lar being available but in the months in which we raided Tempest Keep every week without fail my guild got four. For us at least it dropped more often than the War Glaives and they’re not exactly rare either. Certainly in the case of the phoenix, there will be loads of people farming Tempest Keep every week in search of the Ashes and I would imagine that more players will obtain it that way, than ever will through buying it off the Black Market. What is important about these items is the memories they hold. 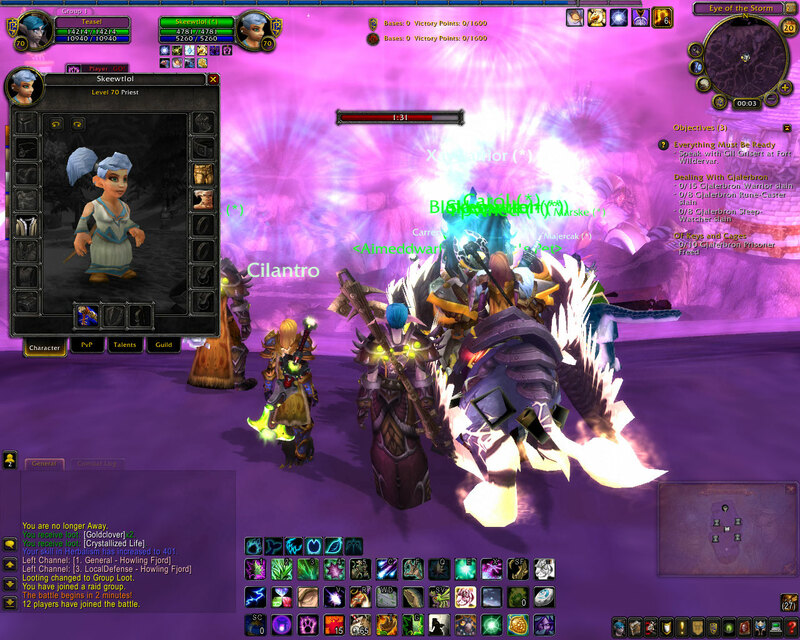 When I quit WoW, I won’t have a plastic Benediction to take away with me but I will have those memories. The people who passed on the Eye of Divinity for me and the people who spent five hours farming demons in Winterspring for the Eye of Shadow along side me. The people who hung out in the Plaguelands whilst I danced about fighting invisible shades, cheer-leading for me, that’s what is so important about my Benediction. Take Spike, my Iron-bound protodrake and favoured mount of Erinys. I got him when Ulduar was hard and every day I see people in trade chat making PuGs to go and do the achievements but that doesn’t take away from my experiences. When I think of that mount, I remember my guild yelling “In the mountains” every time we pulled Thorim and how bad we were at frying dwarves. I remember our melee’s inability to stay on trains and not fall into gaping chasms. It’s the silliness, the yelling and the laughter which stays when all else fades. It’s the people you play with who make the game so amazing, not the pretty pixels we pick up along the way. I think having gold sinks is good for the server economy. In order to make the sort of money required to buy some of the tasty items offered for sale on the Black Market people will have to farm. Hopefully that will encourage people to get out into the world regardless of the point in the expansion’s life cycle and make sure that the normal AH is full at all times. Right now, once you’ve bought the basic gold sinks like the Traveller’s Tundra Mammoth in Wrath and Vial of the Sands in Cataclysm, there isn’t much to pour your money into and that has a knock on effect on the entire server. Of course making desirable items available through in-game gold carries the risk of making gold selling more attractive to the masses but I think the player base is already fairly divided on that front. The people who think that buying gold is cheating, reprehensible and on the other side of the equation, the scum who think it’s fine even though more often than not it comes from hacking accounts. The latter will always find things to buy with their pieces of silver and Blizzard shouldn’t be limiting the game around them. Yes, people around the middle might find themselves swayed towards the tide mark because of this but that would happen regardless of what gold sinks Blizzard chose to introduce. After careful consideration, the Black Market is definitely something I’m going to be looking forward to. I’m also going to be working on increasing my capital some what considerably in the run up to Mists just in case something takes my fancy. When it comes to the scope of what’s offered, I’d like to see a huge variety of items ranging from the currently impossible to obtain to things which rely on those fickle Gods of RNG. I think this is probably a case of the more the merrier.